Last night was our annual Hatchet Hunt! The Hatchet Hunt is an event where every cabin competes to try and find a hatchet hidden somewhere on camp property first. 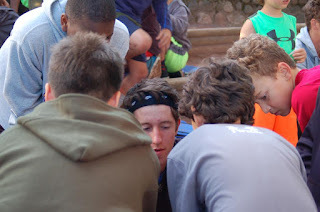 The game is a combination of a scavenger hunt and a race and requires every camper’s participation. During the hunt, the entire camp is given a series of clues one by one and each cabin is able to send two runners to the location where they believe the hatchet is located.